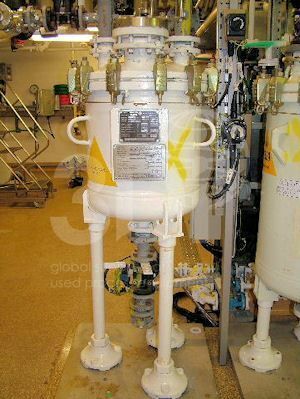 Used 110 Litre Glass Lined Carbon Steel Receiver Vessel, manufactured by De Dietrich, 1999. Model RS100-500×600. Manufacturers No. 62906. Orientation: vertical, cylindrical, dished top and bottom. Dimensions: 508mm internal diameter, 506mm on the straight. 94mm bottom dish. Design data: design temperature -25/200degC, design pressure 6/-1bar. Glass lining 3009 (Blue). Complete with glass inspection report.